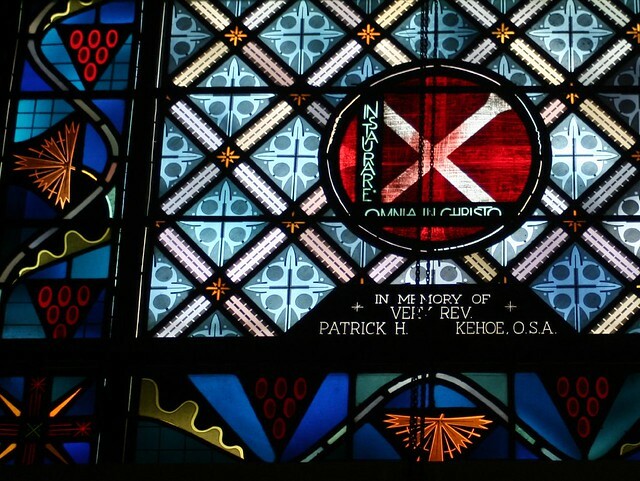 Before you read this post: if you have not gone through my Emil Frei stained glass tour at Built St. Louis, stop reading and do so right now. It is essentially this post, but 30 times as big and way better. 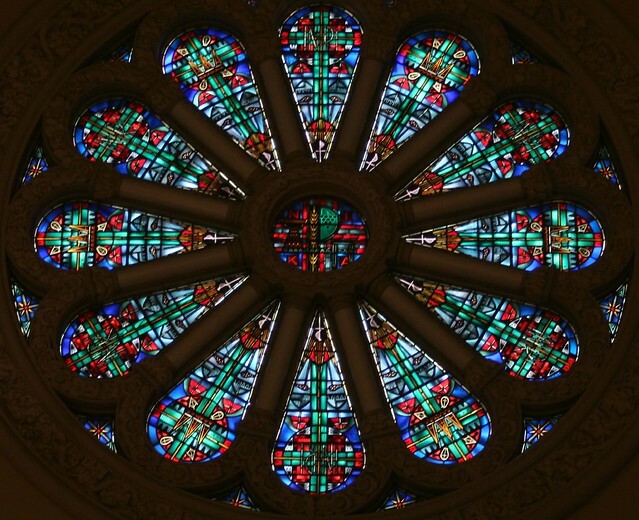 Over the past hundred years or so, the St. Louis-based Emil Frei Stained Glass studio has designed and built windows for thousands of churches around the US. 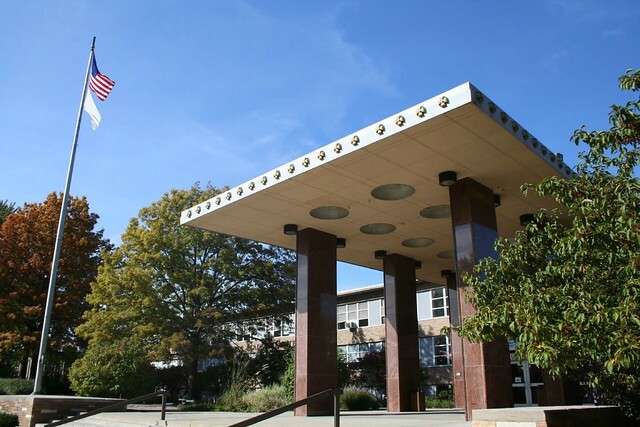 Dozens upon dozens of their Mid-Century works dot the St. Louis area, and they are common throughout the Midwest – but the company never made major inroads to the Chicago market. The Chicago area work of the Frei company is simply not enough to represent their styles well, but it does make an interesting side note to their work in St. Louis. I would speculate that strong competition from local companies like the Willet Studio kept them from gaining a strong foothold here. Stylistic tastes may also have played a role. 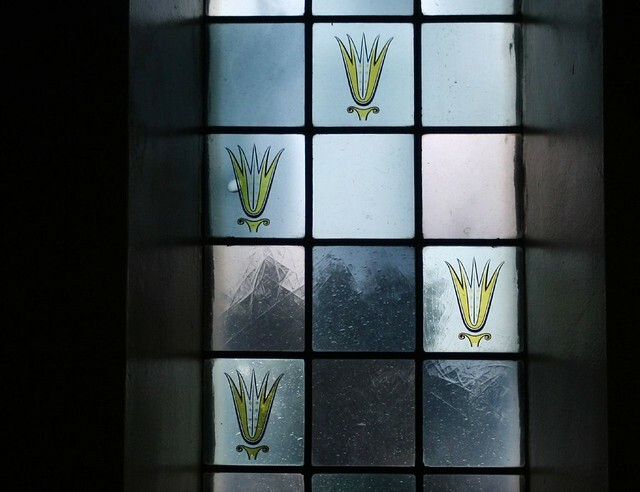 The Frei atelier produced Art Deco- and Surrealist-influenced flat glass windows of great subtlety and abstraction; the Chicago market tended to prefer a bolder, brawnier and more literal approach, best seen in the prolific faceted glass windows of Chicagoland churches. 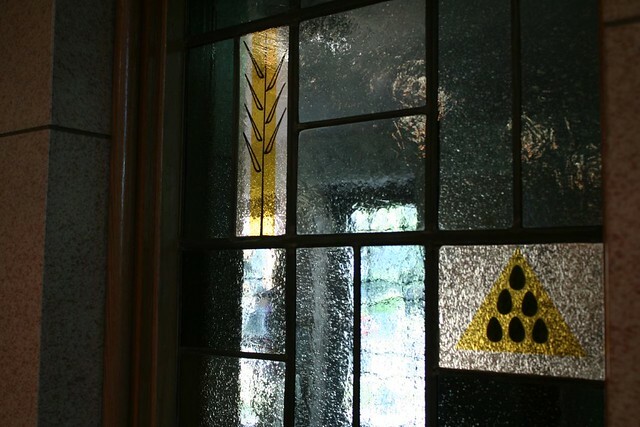 The Frei studio was actually instrumental in the development of the faceted glass window style (aka “chunk glass”), and carried out a number of commissions in the medium, but it was something of a side note for the studio, compared to their flat glass output. 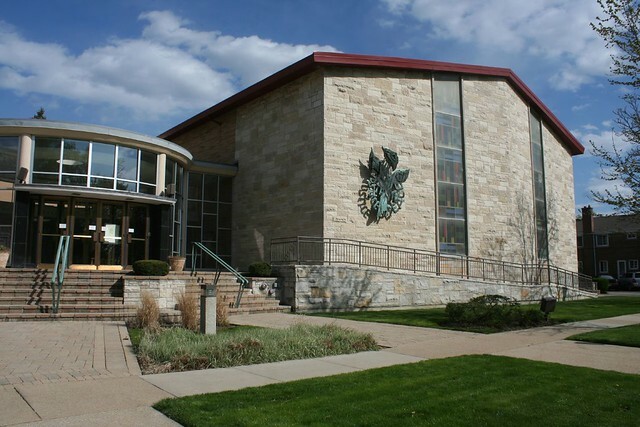 I know of only two major Frei commissions in the area – the sisters’ chapel at the Wheaton Franciscan Sisters Motherhouse, and the Oak Park Temple Synagogue on Harlem Avenue. So far I have not managed to photograph either one, though I remain hopeful that will change. 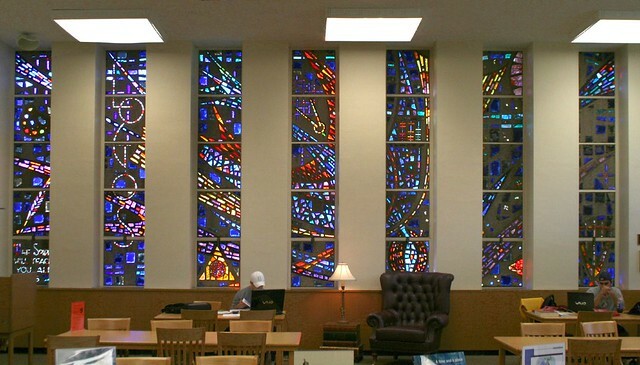 The windows at Oak Park Temple were designed by Rodney Winfield, and appear to share similarities with his contemporary design for Shaare Zedek Synagogue in suburban St. Louis. 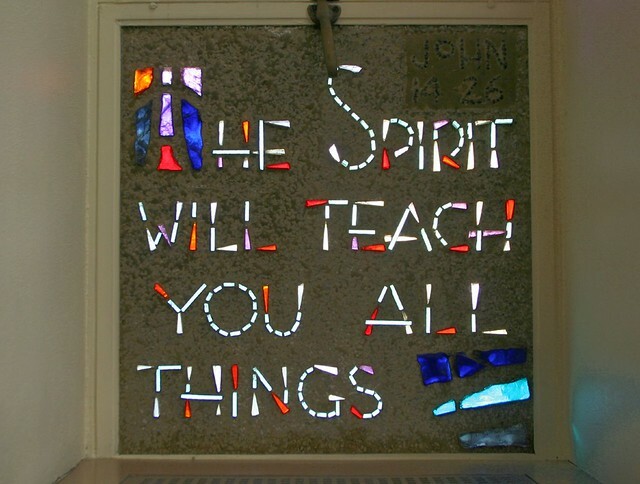 “The Spirit Will Teach You All Things” is a (relatively) rare faceted glass installation by the Frei company. 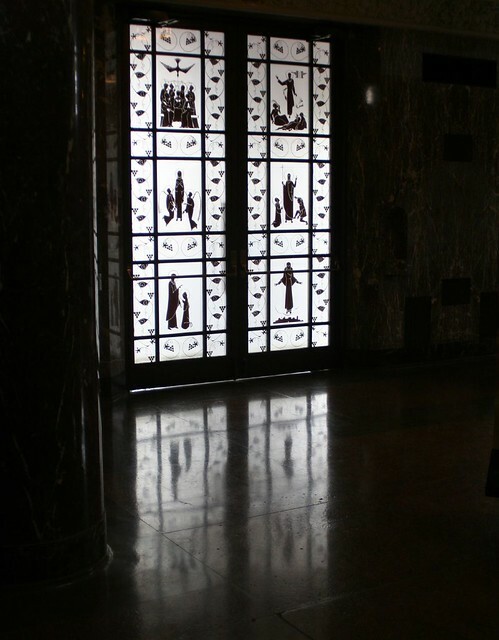 The design was done by Robert Frei and installed in 1957, as a gift from then-mayor Richard J. Daley. 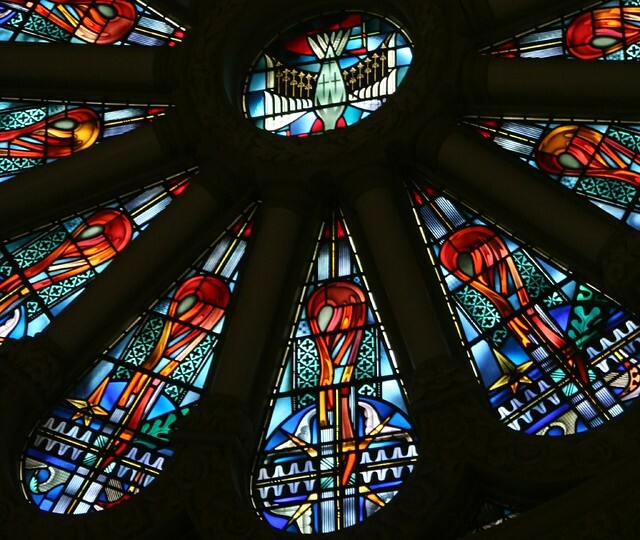 The design symbolizes a bird in flight – the Holy Dove, and the spirit of learning. 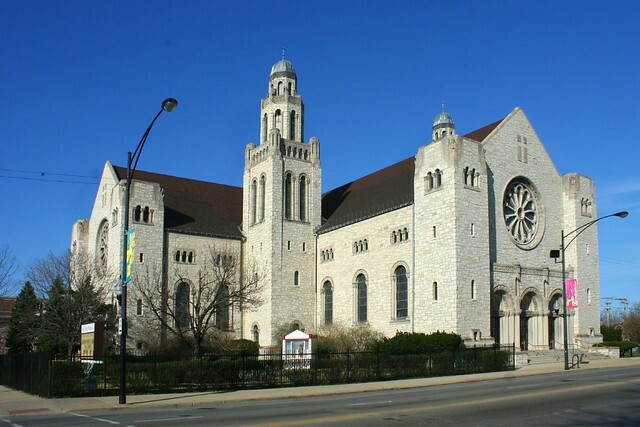 St. Rita Catholic Church was designed by architect Arthur F. Moratz of Bloomington, a prolific church architect. 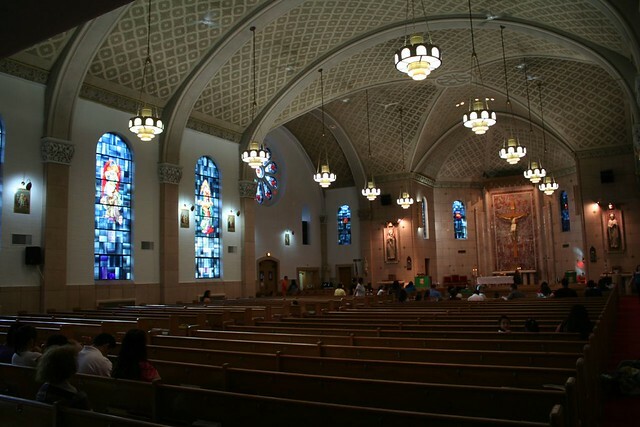 St. Rita’s was begun in 1948 and finished in 1950. 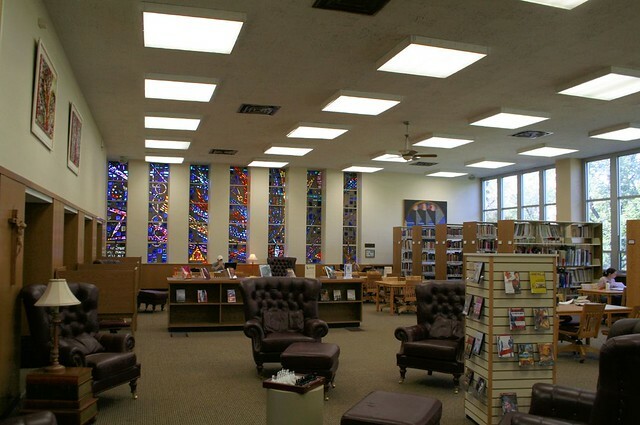 Standing on 63rd Street, the building was built around an existing church on the site, so services could continue uninterrupted. 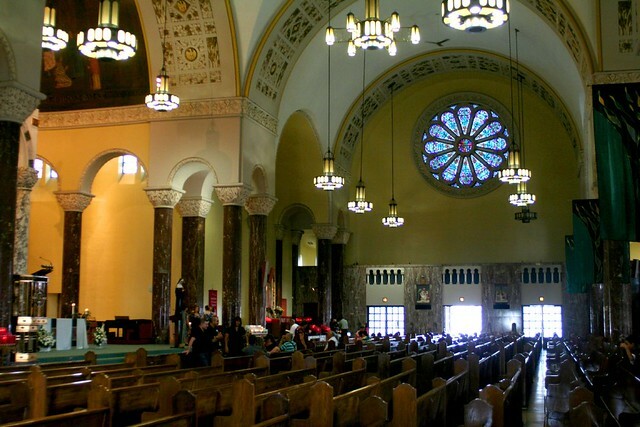 The church sanctuary is a high, huge space, with Romanesque vaulting and clean, crisp detailing. 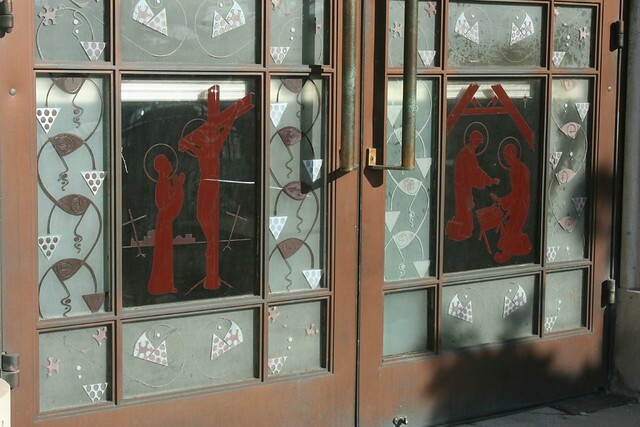 The style used on St. Rita’s entry doors is unique. 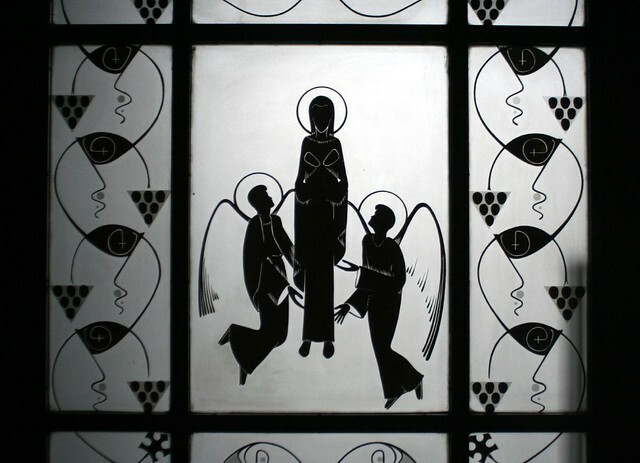 On white frosted glass, black silhouettes are painted and baked on, representing “the mysteries of the Rosary”. Curiously, the paint appears red from the outside. 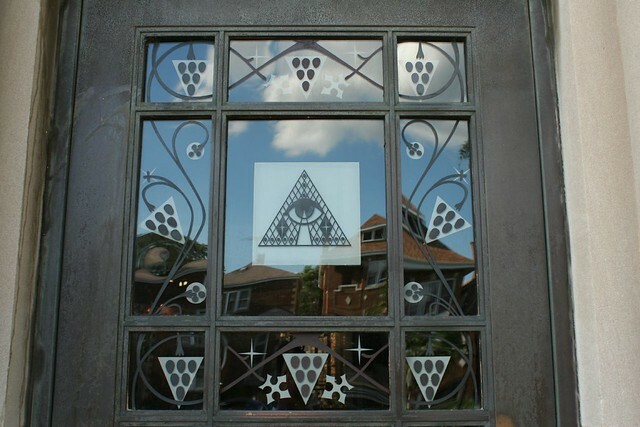 The triangular grape bunches were my first clue that this might be a Frei church – they are an extremely common device. 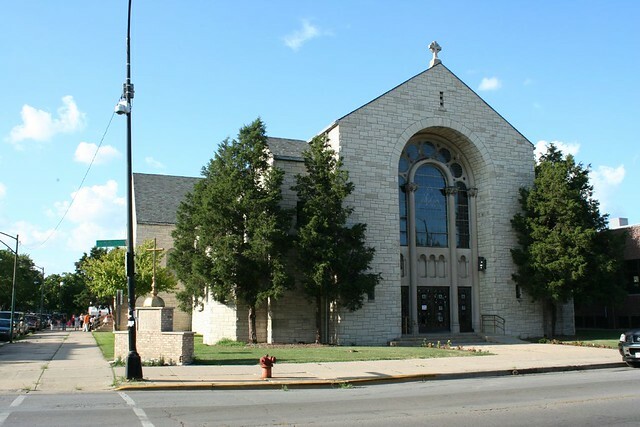 St. Clare is a modest little Catholic church on 53rd Street, with a cornerstone dating it to 1954. 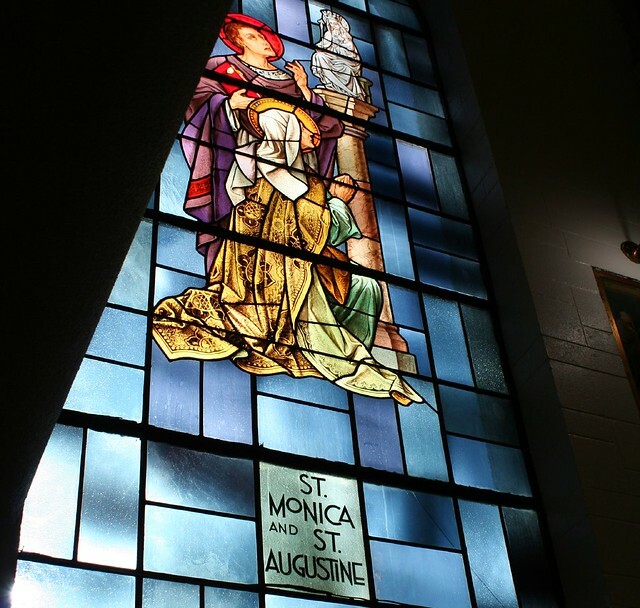 Its windows are humble and not especially distinguished, but still bear some of the Frei studio’s hallmarks – including a recurrence of the black-etched silhouette designs from St. Rita. 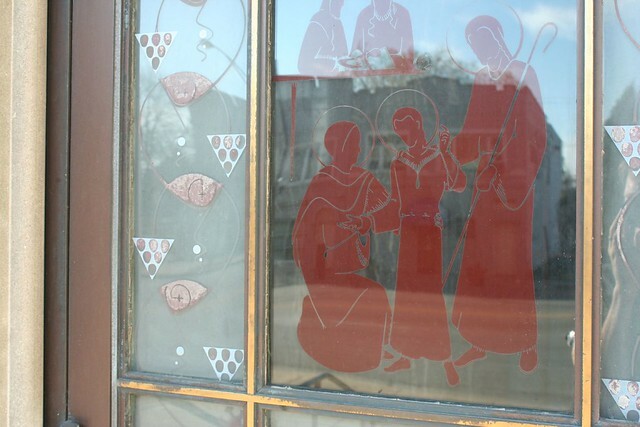 The primary figures are done in a traditional literal style, but the lettering and the multi-shaded background glass hints at the window’s more contemporary vintage. The antiqued glass features bubbles and irregularities included to add texture. As with St. Rita’s, the wheat and grapes symbolize the Eucharist. 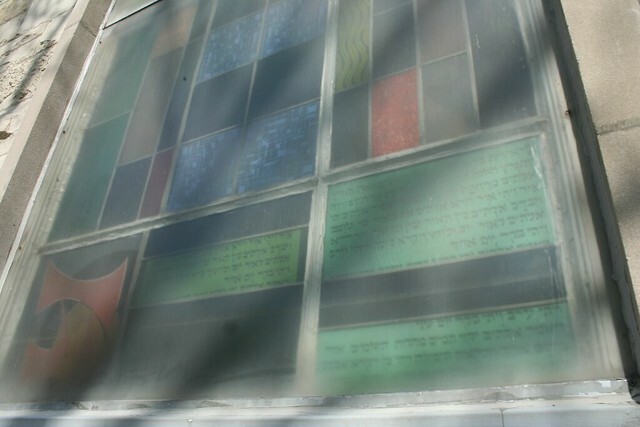 You need to check out the windows at KAMII synagogue. I’m all but certain that the windows are Frei. They have the distinctive look of some of their work in the ’20s and I found a reference on the web that verified it. I don’t know where the signature is, but I’d bet it is somewhere hidden away.